Carmen Sigrid Knudtson passed away at Tacoma Lutheran Retirement Community on Sunday, May 13, 2018 (Mother’s Day), at the age of 86. She was born on April 12, 1932 in Stanwood, Washington to Bennie and Sigrid Stensaa who were Norwegian Lutheran Farmers. Her mother died at the age of 23. Carmen was only 10 1/2 months old. Carmen had 4 children: Marsha, Melinda(Mindy), Mark and Margaret. In October 1959, Carmen met Ralph Knudtson and started dating him in April of 1960. They married on July 30, 1960 in the chapel at Trinity Lutheran Church in Parkland. He was the love of her life and they had a beautiful, wonderful marriage. Ralph adopted Marsha, Mindy and Mark. They then had a daughter, Margaret Jean who was born on December 15, 1961. Carmen was a strong, giving, loving, courageous and wonderful woman who was passionate about helping others in any way that she could. For 25 years she worked as the general purchaser at Pacific Lutheran University. She loved her job and the people she worked with. Carmen is preceded in death by her husband Ralph who passed in 1982, and by her daughter Marsha who passed in 1997. She is survived by her children; Mindy (Steve) Wolfer of Gig Harbor, Mark (Shirley) Knudtson of Wisconsin, Margaret (Sam) Tuttle of Tacoma; Grandchildren Jason, Kevin, Lisa, Erica, Heidi and Heather, Timothy James (T.J.) and Olivia. She has many wonderful grandchildren and great grandchildren who she loved dearly. A Celebration of Life will be held at Trinity Lutheran Church in Parkland, WA on June 2, 2018 at 2pm. All are welcome. 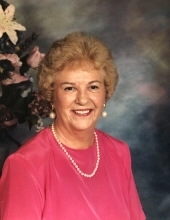 To send flowers or a remembrance gift to the family of Carmen S. Knudtson, please visit our Tribute Store. "Email Address" would like to share the life celebration of Carmen S. Knudtson. Click on the "link" to go to share a favorite memory or leave a condolence message for the family.